Convents and cloisters are traditionally thought of as being cold underfoot…but this is no longer true for the Convent of St George Alamanos about 15km from Limassol, in Cyprus. Because now, thanks to AHT’s Amorphous Metal Ribbon Underfloor Heating technology, the nuns who paint icons, cultivate wild flowers and herbs and produce traditional Cypriot sweets, will have warm stone floors on which to tread. Originally built in the 13th Century, and destroyed by the Turks, the convent was renovated about 100 years ago. 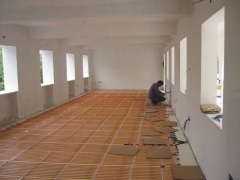 Just this past week, OPUS Electrical Technologies Ltd – AHT’s representatives in Cyprus – added a high-tech innovation, when it installed 130 square meters of AHT heating mats in the dining hall and kitchen. 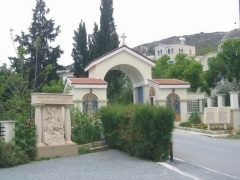 Mr Kyriacos Bilicos Managing Director of OPUS, added that the Convent was famous throughout Cyprus and that he was very pleased to have been able to provide such a high technology solution to such a revered antiquity.